TWELVE STAFF FROM the Bausch & Lomb plant in Waterford collected a cheque for over €2.5 million this afternoon after their Lottery win. Each member of the workplace syndicate will take home just under €215,000. The group, who always used the same numbers, made the trip to the National Lottery headquarters this afternoon after playing together for almost 16 years. They won the jackpot with an €8 ticket bought at the Spar store in Ferrybank in Waterford on Saturday. Members of the group say they plan to pay off their mortgages, go on holiday and buy new cars. “I scanned the ticket, as I do every week, and a message flashed up ‘Congratulations – please contact us!’ I was delighted but didn’t expect that we’d won the whole Lotto jackpot’. I checked it a couple of times but refused to believe it. I rang the wife who had been up at a hurling match and I asked ‘where are ya – get home fast, we’re after winning the Lotto! Then I started ringing the other lads in the group. The group range in age from 37 to 50 and have 16 children in total, with another on the way shortly. Bausch and Lomb has been operating in Waterford since 1981 and make ranges of contact lenses. 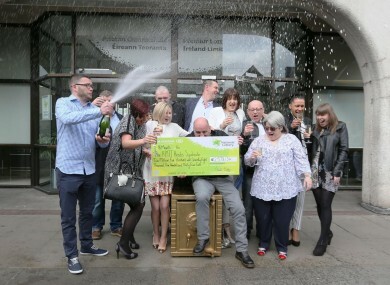 Email “Waterford workers collect €2.5m lotto cheque after 16 years of playing the same numbers ”. Feedback on “Waterford workers collect €2.5m lotto cheque after 16 years of playing the same numbers ”.